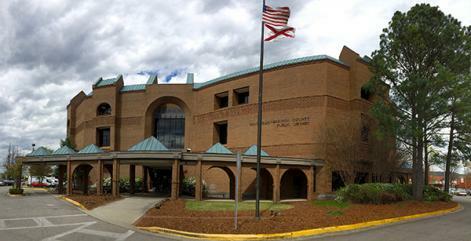 The Downtown Huntsville Library offers a large collection of print and multimedia materials and programs for all ages. The 123,000-square-foot facility has 11 meeting rooms available for reservation that can accommodate small study groups and large gatherings. Our Readers Advisory program offers customized and personal service to those who want help choosing their next great read. The second floor has a business center with faxing, scanning, and printing capabilities, a technology training center offering classes year round, and a satellite office for North AL Coalition for the Homeless. The downtown location is also home to our community’s only Subregional Library for the Blind and Physically Handicapped, offering resources such as Digital Talking Books or braille material for the visually impaired or those with physical disabilities. The third floor houses our Special Collections department with access to print and online resources for genealogical research and its archives with materials and items pertaining to the history of Huntsville, Madison County, and North Alabama. Read more about the Downtown Huntsville Friends of the Library. From I-565 East, take exit 19A for Memorial Parkway South. Exit onto Governors Drive (second exit, immediate after Clinton Ave.) Turn left at light onto Governors Drive (US-431). Turn left at first light onto Monroe St. Turn right at first light onto St. Clair. Library parking lot is on your left.